If Hollywood has taught us anything that would be that the key to a successful product lies in appealing to all demographics. The product that can't be enjoyed by the entire family has only a limited commercial value. Electric skateboard manufacturers have learned this lesson pretty fast and diversified their lineups to sooth different customer types. So, we’ve got an entire range of products aimed at youngsters who have yet to cut their riding skills. The interesting about it is that, besides the fact they are usually scaled down to fit the children, these skateboards are not cornered with any other limitations, so this should be a pretty interesting roundup. So let’s take a dive in this vivid market segment and try to find out which is the best electric skateboard for kids. If you’re in a rush, this table will sum up our experience and the models we went through. EASY TO USE: Variable speeds handheld 2.46G wireless remote control and 10 meters effective distance. These three are the models we’d recommend to our friends & family, hands off. But, before we proceed to our top contenders, let’s see what truly makes youth oriented electric skateboards unique, and try to single out some of the important considerations you should keep in mind when making a purchase. Kids are not as skilled as adults, and the features that may sell some of the professional boards can be looked at as ballast in the child-friendly market segment. Given the fact they are often used for commuting, electric skateboards should be able to achieve high speeds. But, if you take a second to think through it, you have to ask yourself just how much commuting your kids are actually going to do? The answer is, very little. On the other hand, allowing your children access high-speed units can potentially expose them to danger if they are not yet skilled riders. So, this time, more is not necessarily better. If you want to keep your kid safe, the speed limit of 20km/h should be just about right. When it comes to size, discussion about electric skateboards for kids becomes somewhat moot. A lot of manufacturers do push the products that are scaled down to better suit the children’s bodies. The problem is, regular electric skateboards (and regular boards for that matter) are not that unapproachable to begin with. Even the legends like Tony Hawk sharpen their riding teeth with adult-sized skateboards. The moral of this short discussion should be that there is truly no bad way to go. Smaller skateboards will set straight the learning curve (not that much, though), while the regular sized boards can have a broader family appeal. It really boils down to you. You should not however go past the length of 78cm. Discussing the weight in these terms is much simpler – the lighter the board the better. Your kids will have a much easier time handling the unit, and if the battery runs dry (a very likely outcome) they won't have any problem carrying them around. Still, light weight should not come at the expense of structural integrity. The skateboard needs to be well put together and use standard materials (more below). Poor quality can compromise the safety of the rider. Once again, battery lie is a fairly easy topic to discuss. The more juice you manage to squeeze into the board, the better. Still, since children use electric skateboards only in short bursts don’t let the unit’s battery life be too big of a limiting factor. Fast charging time can remedy most of the problem caused by poor capacity. Also, when checking the battery capacity, you can give yourself a break and skip the number of ampere hours and proceed to the range that describes how many kilometers a skateboard can pass in one charge on average. This number can be affected by the weight of the rider and the riding speed, but in the case of the children, range does a great job describing the unit's capability. The combination of maple wood deck and polyurethane wheels has become a gold standard for entry level and mid-range skateboards. Don’t accept anything else. Bamboo and carbon inclusions are more than welcome. Features don’t necessarily make or break the quality of an electric board, but they can do wonders at improving their safety and riding experience. Let’s take a look at some of the most popular picks you can expect in this niche market range. 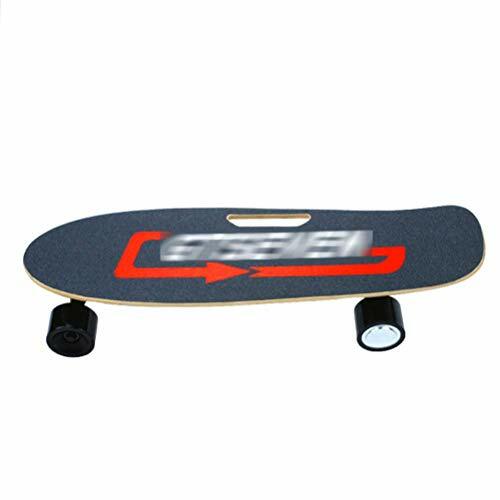 Grip tape – Essentially, grip tape is used to increase the roughness of the deck and ensure the rides’ feet will stay in place during riding. An essential upgrade when it comes to child safety. Remote safety settings – The skateboards needs to have different safety settings that limit the speed of the unit. This way your children can enjoy even some of the more nimble boards without ever getting into real danger. Accessories – Although they are not necessary, various accessories that improve the value of the package are certainly more than welcome. Some of the most common inclusions are backpacks, carrying cases, remote straps, and others. Benchwheel’s contender in this roundup makes a small leap regarding the price in comparison to the previous entry. It makes leaps and bounds in terms of the overall quality. Hat’s off to the engineers for making the most of the money they got to make the unit. But, let's be methodical and go one step at a time. The strength of this board definitely doesn't lay in its design. It's bland and uninspired, so get over it. The choice of the materials keeps the high standards of the niche but doesn't do anything exciting to exceed it either. What you’re left with is a pretty standard maple/polyurethane combo that’s put together sufficiently well to sustain some beating and provide solid riding experience. The main star of the show here are the components that can be found under the deck. The dual motor setup is incredibly powerful, and the speeds you’ll be able to achieve as a result are, as a matter of fact, pretty awesome. Even better, the skateboard offers a rock-solid commuting range. Of course, all these power can be easily tamed through speed settings you get with the pre-packed controller. What this amounts to is fun for the entire family. As for the performance, we are happy to report that everything works just fine. The skateboard is nimble, responsive and handles extraordinarily well when cutting the curves (this can be attributed to the slightly curved deck design that compensates for the maple’s natural stiffness). 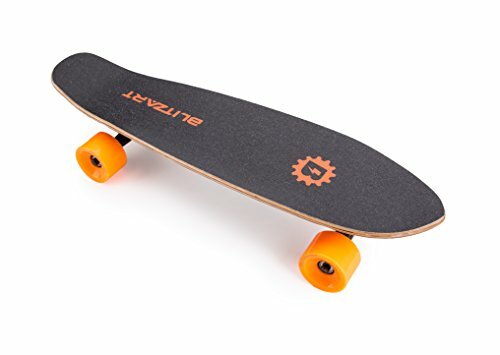 Bottom line, if you don’t mind allowing your children access to the board that packs a lot of power under the deck and have enough confidence they won't misuse the speed limits you agree upon, you'll hardly find a better unit than this. Getting the real value for the money you are asked to pay feels oddly satisfying. Well, this is the time to enjoy because Benchwheel somehow managed to check the marks in all important departments. For a start, the skateboard is a demon – it can fly at the speeds that go all the way up to 30km/h. The range doesn't fall too much behind. You can pass pretty sweet 19 kilometers in a single charge. All these wonders are provided by the powerful dual 1800W motors charged by quality LiFePo4 batteries that take three long hours to charge. Unfortunately, Benchwheel missed the opportunity to hit the home run with this board by including some exciting special features, but the core specs are so good we’ll give it a pass. With the things as they are, you will have to be contempt with high-quality grip tape and solid remote that allows you to choose between speed and energy settings. Blitzard is a manufacturer known for the series of affordable, yet very solid products aimed at different customer groups. Their foray into the youth-oriented segment falls perfectly into this description. As you can see from the title the board’s deck is scaled down to 28 inches or 71 centimeters, which places the board firmly into the child-friendly segment and rules out the adults from the list of its potential users. Still, this is a matter of personal choice, so we won’t complain about it. The more important thing is that the deck is made out five layers of durable maple sandwiched between two layers of bamboo – a combination that provides the optimal balance between control and flexibility and a true sight to be seen in this price range. The polyurethane wheels are not that bad either, and powerful 250W brushless hub motor works like a charm – it’s quiet and snappy. As for the drawbacks, we could say that the board features a pretty underwhelming range, but that's not the biggest problem. Although the components used to build the skateboard are pretty solid, craftsmanship is all but. This comes off as the biggest problem when it comes to battery – you may lose power after a couple of slight bumps. Mini Flash is a unit that sits perfectly in its niche with the only exception of the pretty stunning max load of 113 kilograms. This entails a lot of fun for the entire family, as long as you take some time to get used to the smaller deck. Unfortunately, the range of only 12 kilometers somewhat undermines this quality. The rest of the specs are better balanced – Mini Flash rides at the speed of 19km/h and weighs very forgiving 4 kilograms. A compact unit if there ever was one. Much like the previous product we reviewed Mini Flash is devoid of any advanced features. Fortunately, you have the two speed settings that will allow you to lock the speed and battery capacity to suit the need of your children. For what it’s worth, the remote is ergonomic and works pretty well. Airwheel M3 is an excellent piece of engineering that has already found its way on several of our lists. 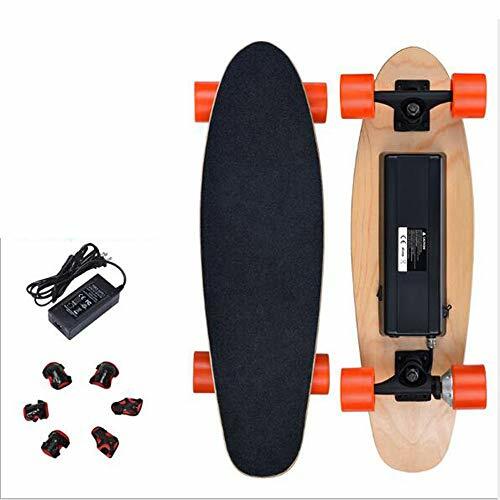 That should not be too much of a surprise because we are talking about a well-made, affordable electric skateboard that’s even capable of traversing difficult off-road terrains. Even though M3 is far from perfect, when you take into consideration its price/value ratio you may end up with one of the best units to introduce your youngsters to riding. 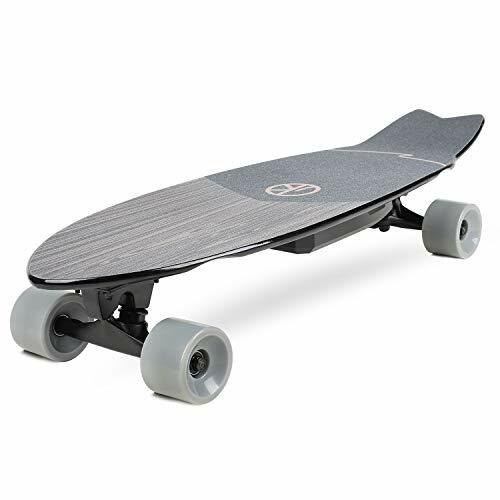 But, let's start from the beginning – M3 is built from high quality Canadian maple which looks like it can sustain a lot of abuse and the deck is covered with fine grip tape that is capable of enabling solid riding stability. Throw into equation 4.7-inch wheels tucked into the ski-proof tires and high-strain aluminum axis body capable of shock-absorption and you will get one well-built piece of hardware that offers the quality way out of its price range. What’s even better, M3’s specs are more than suited for the market range we are covering, and its performance is smooth and snappy. While your children are riding, they won’t experience any twitching or jerking. 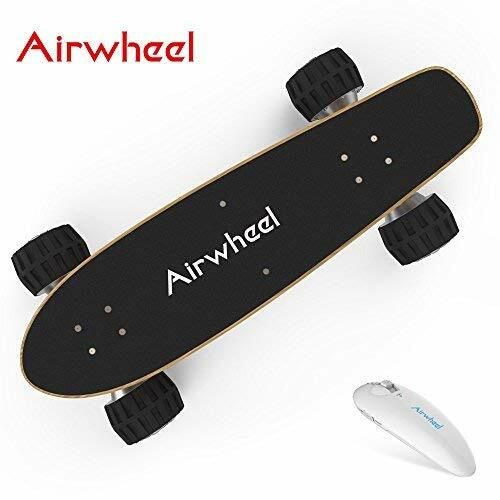 Also, there is an option to connect the skateboard to a smartphone and use it for navigation instead of the remote and pretty good range that exceeds most of the entries in this price segment. However, you have to remember that this unit is built primarily for rough off road tracks, which implies several things. One of them is the sheer power you don't necessarily want your kids being exposed to and the increased weight that are characteristic of this type of boards. These two things may end up being one of M3’s biggest drawbacks. As we already mentioned above, M3 is a pretty snappy skateboard – especially taking into consideration its above the average weight of 11.55kg. This number is largely the product of a pretty powerful motor which allows the board to carry the weight of 100kg, so take the fact that the board won’t be exclusively used by your children as a silver lining. The rest of the specs is pretty flawless. M3 is capable of breezing at the speed of 20km/h covering the range of 19 kilometers in a single run and charging the battery from 0 to 100% in two hours which is more than manageable. Unfortunately, as good as its specs may be, M3 is seriously lacking in advanced features. Still, you have the option to choose between different speed settings, some of which suited for the young riders. That should be more than enough at this price range. The unit can easily traverse all types of terrains. Vokul V1 is a product that is so similar to the previous mention on this list, but uses its building blocks in such a different manner it’s hard not to give the praise to the engineers on how well they used the budget they had on disposal. This unit is still very affordable, but makes the upgrades in virtually all relevant departments. For a start V1 looks good – the deck is slim, raised kick-tail always pleasant to see and the design of the grip tapes brings a welcome change of pace into the conversation. It is also good to know that the deck is made out of seven-layered maple, so Vokul hadn’t placed all of its chips on looks alone. As for the performance, V1 does its job pretty well. Although the steering could be improved (the unit feels somewhat stiff when cutting curves), the unit performs very stable and accelerates at forgiving rates. The battery feels somewhat bulky and can be damaged during rougher rides, but V1 was never meant for off road terrains. 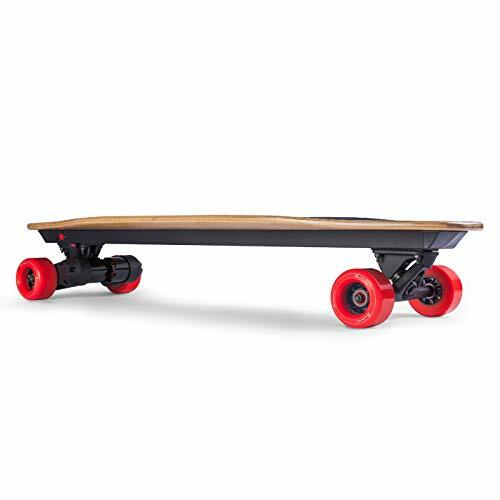 So, we have a scaled down version of a city cruiser that’s fast, offers pretty good range, high quality deck and surprisingly good remote which gives the rider a couple of different speed settings to choose from. The performance is stable and snappy, motors quiet and design excellent. If we would have to point out some of the drawbacks (and there is very few of them) we would say that wheels could be bigger and of better quality. The ones you get in the package will tear down pretty easy if you stray out of asphalt. Vokul V1 could be the best described as an electric skateboard with perfectly balanced specs. Nothing strays too far out of average, and everything works to improve the value of the unit without breaking its price. So, V1 is capable of covering the ranges of 16 kilometers in a single charge and run at the rock-solid 20 kilometers per hour. It is also worth mentioning that V1 feels pretty light so you won’t have any problem carrying it around if the battery runs dry. Although not revolutionary, V1 brings some welcome changes to the table. First, you get three speed settings which give riders more freedom to choose from. Second, there's the regenerative braking that has a very positive impact on battery life. Finally, the package includes a well-made remote and a couple of useful assembly tools. When making this board, BIN hasn’t made any effort to conceal the fact the unit is aimed at the beginners. So, some concessions in the design department and premium features are to be expected. And truly, the design of the unit is as uninspired and by-the-numbers as it gets. But, the good news is that, the rest of the board holds on much better. The deck is made of maple, and you do get the inclusion of a raised kick-tail. The wheels are pretty solid and they offer better durability than the one we’ve seen on Vokul’s V1. They are also very elastic, and you won’t feel drastic bumps even if you stumble upon rougher city terrains. Non-slip grip overlay does a good job at keeping the rider’s feet firmly on the board, so we can say the build quality and craftsmanship are more than satisfying. Unfortunately, the same can’t be said about core specs. Compared to some other entries we’ve seen on the list, BIN’s product feels noticeably underpowered. And we are not talking about specific specs – you get a downgrade in virtually all departments. So, the question needs to be asked where the money that’s been put into manufacturing went. This issue could be mitigated if BIN’s Novice Electric Skateboard offered some interesting features or put more value into the package. Unfortunately, what we are left with is the unit that’s built well, handless very good, but falls short in all other departments. So, we mentioned that BIN Novice Electric Skateboard feels underpowered. What this statement translates to in cold numbers is the above the average speed of 15 kilometers per hour and crippling range of only 10 kilometers. Curiously enough, the 150W motor is capable of carrying the weight of 120 kilograms, but this fact does very little to elevate the rest of the specs. A little disclaimer here – when we talked about purchase considerations we mentioned that child-friendly units don’t need to be too fast or feature extensive range. But, if competition offers a better deal, there is no reason to opt for the worse option. If we need to point out one of the saving graces of BIN’s product we will say that remote is designed and works pretty well. The plastic used for build feels solid and you get a nice strap to keep the unit in the hand. We wish, tough, we could get more than two speed settings. You remember when we called the design of BIN’s skateboard uninspired? We take it back. If you want to go unnoticed, you would be hard-pressed to find the board that looks as bland and generic as then GYFY’s product. Seriously, this entry feels like it was designed by someone who has only a passing knowledge of how electric skateboard should look like. So, the points are taken from the looks department. What about the rest of the specs? Well, they are somewhat bittersweet. The motor feels reasonably powerful and results in rock-solid carrying capacity. If you can adjust to the smaller deck (the total length of the unit is 710 millimeters), you won’t have any problem riding the unit while your children are talking the break. The speed and the range are well-suited to the market segment, but, as we already mentioned, that is not something to brag about. At this price point, these specs feel horribly underwhelming. Furthermore, speed issues could be much better solved with comprehensive settings and a good remote. Moving on to the performance and we can see that GYFY’s product handles more than solid. There are some small things we’d like to point out, though. Acceleration feels abrupt. If you are running a higher speed setting, you might fell losing your ground. Second, making a turn takes some clearance. Finally, we come to the materials and craftsmanship. Surprise, surprise, they are also pretty standard. You get your maple deck, polyurethane wheels and standard grip tape, but nothing here screams extraordinary or pushes the board above the average. When it comes to the cold numbers, GYFY Electric Skateboard falls awfully close to the BIN's product that already took a lot of beating for its specs. The unit is capable of running at the speed of 15 kilometers per hour and passes the ranges of 10 kilometers in one charge. The good news is that, if the motor fails to move the unit fast, it allows for a certain degree of climbing – the unit can successfully manage the slopes that go up to 17 degrees. Once the battery runs dry, you will be able to recharge it in two hours. It is hard to escape the feeling that GYFY lost the opportunity to score some big points by stacking their entry with interesting features. This way, though, you only get a by-the-numbers grip tape and two-speed remote which is, to be quite honest, well put together. Do I need a driver’s license to ride an electric skateboard? It really depends on the country you are living in, but in most of the cases, no. In terms of traffic regulations, skateboards (even the electric models) in the samke basket like, for instance, rollerblades. Still, if you want to use the skateboard on road, together with other traffic participants, you will need to abide by speed limitations proscribed by the local legislative bodies. 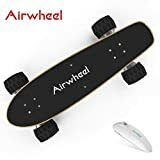 What are raised kick-tails used on electric skateboards? To put it simple, kick-tails are used for better handling. If your unit has one, you will be able to cut the curves much sharper, perform manual braking, and, once you develop enough skill, even perform some pretty sweet tricks. What’s the difference between speed settings on electric skateboards? Slow – You get reduced speed and about 20% of battery on disposal. This is the option your kids should be using until they learn to ride better. Eco – This option enforces even stronger speed limitations, but expends the available battery to 40% which makes an excellent choice for commuting. Fast – Usually, this setting allows you to ride the board at full speed but gives you access to only 60% of battery. GT – You can ride the board how you see fit. GT setting is often used for harsh off road tracks. Can electronic skateboards be used once the battery runs dry? Yes. Hub motors are very forgiving, and even when you spend all the juice, you will be able tu ride the board without much resistances. Pushing the boards that feature belt drives is a bit more difficult but certainly not impossible. Q: Can kids use electric skateboards? Sure, but they need to have some skill if you want to keep them safe. So, before you introduce them to electrical skateboards, give them some time to sharpen their skill on the regular units. We hope you enjoyed this roundup of most popular electric skateboards aimed at children and youth. What do you think about our choices? Let us know and share the post with your friends on Facebook.